Lord Shiva is a palpable presence in Varanasi. He is worshipped in the temples, prayed to by the river and everywhere – under trees, by narrow lanes and in the puja room of houses there are shivalingas garlanded with flowers and bilva leaves. Images of the god are painted on walls and sold as posters and calendars. They sing to him, write poetry about him and Parvati and during festivals like Shivaratri the city goes into frenzy in his worship. For the people of this city he is Baba, a paternal figure who lives with them and listens to their prayers with benign generosity. 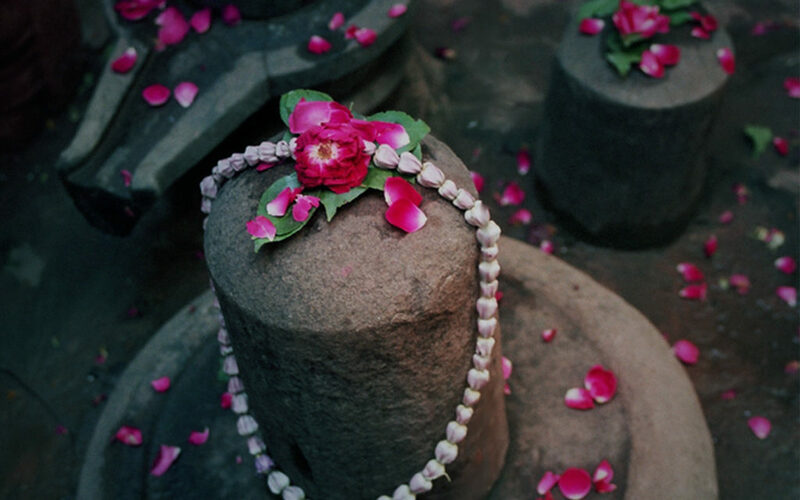 So they say, “Kashi ka har kankar, bole Shiv Shankar” – every pebble in Kashi sings the praises of Shiva. 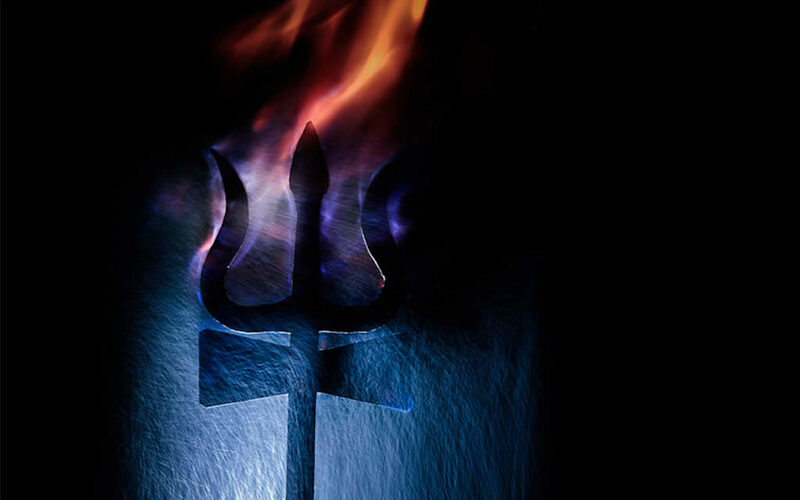 The Matsya, Kurma, Linga, Shiva, Skanda and Agni Puranas are written in praise of Shiva and contain many mythical stories and some are set in Varanasi. There are also a set of books exclusively about Varanasi and Shiva called Kashi Khanda and Kashi Rahasya. According to Hindu mythology our universe is an endless cycle of birth-death-birth, of creation and destruction. Lord Brahma is the creator of the universe; Lord Vishnu is the preserver and Lord Shiva the destroyer. After the first three yugas of Satya, Krita and Treta, when the world is full of sin during the final Kali yuga an enraged Shiva begins to dance the manic tandava, his third eye opens in rage and the universe ends in fire, earthquake and natural calamities. Devotees of Shiva say he then participates with Brahma in the creation of the new universe that begins the cycle again. Shiva was never an important Vedic god and in the Rig Veda scholars trace an aspect of Shiva is a minor god, an angry, red faced deity called Rudra. In the pre Aryan Harappan civilization they worshipped a god of animals who is similar to an aspect of Shiva called Pashupati. During Vedic times the gods like Indra, Agni and Varuna were worshipped and it is only later that the great trinity of Brahma-Vishnu-Maheshwar and the goddess Devi became the most popular deities of the Hindu pantheon. Shiva is a complex god. He can be volatile and angry, gentle and generous and often unpredictable. In one aspect he is the great yogi, a detached ascetic who wanders the earth with matted hair, wearing animal skins, his body covered in ash. 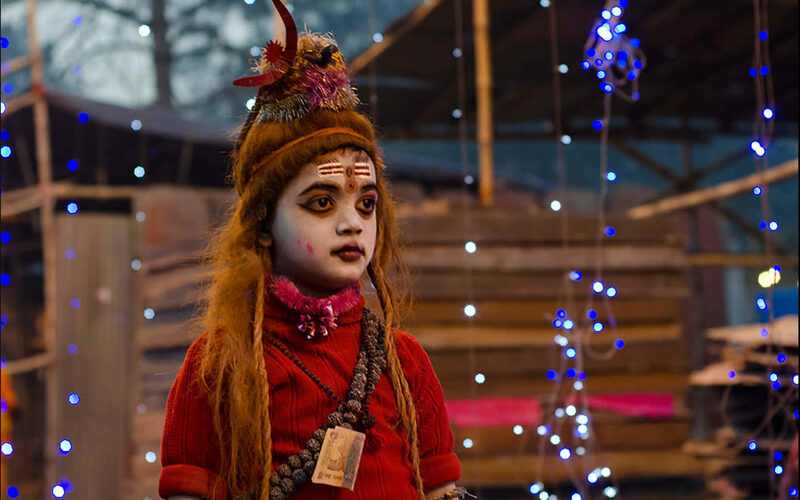 He lives on Mount Kailash in the company of ghosts and goblins; he has snakes writhing around his neck, carries a begging bowl and wears rudraksha beads. His weapon is a trident called the trishula and at times a bow called Pinaka. He plays a rattle drum called damaru and his vehicle is the bull Nandi. The wandering sadhus are often in his living image. Then like a typical contrary god he is also a family man, married to the goddess Parvati and with sons Kartikeya and Ganesh. As the more civilized Shiva, he now has sandalwood paste replacing the ash on his body, he adorns his hair with the crescent moon and the river Ganga, he wears silk clothes, garlands of bilva leaves and scarlet hibiscus flowers. Mendicant and husband, dancer and father, he is oddly human in his multi-faceted character and that is why he is loved with such absolute trust by his devotees. MANY NAMES OF SHIVA: They say Shiva has 1008 names. Devotees recite his 108 names as a mantra called shatarudriya. Some of the more popular names of Shiva are: Shankar, Vishwanath, Kedareshwar, Rameshwar, Maheshwar, Mahadev, Mahayogi, Bholanath, Gangadhar, Kailashpati, Avinash, Tripurari, Girish, Bhootnath, Somnath, Amarnath, Hara, Nataraja, Shambhu, Pinaki, Ishaan, Mahakala, Ashutosh, Neelkanth, Mritunjoya, Vyomkesha, Diptani, Pashupati, Umapati, Chandrashekhar, Dhurjati, Triguna, Chidananda, Veerbhadra, Neelalohita. The stories in the manuscripts about the city called Kashi Khandas say that when Parvati married a homeless mendicant living on a mountain top Shiva felt it was time they had a proper home. They searched in heaven and earth until their eyes fell on the golden spires of the palaces of Varanasi standing by the silver waters of the Ganga. Enchanted by the sight Shiva came to stay at Kashi and he promised that he would never leave it. So Varanasi is called Avimukta, a city that is never forsaken by Shiva and Parvati. It is also Rudravasa, the home of Rudra; Anandavana, his garden of delight and as he is also the ascetic who wanders around cremation grounds, it is Mahashmashana. Shiva himself calls his home Kashi, the city of light – the eternal light of enlightenment and the light of liberation. The name Shiva means auspicious and gentle and devotees believe that Shiva never refuses a prayer. The Kashi Khandas say that as he is so generous, all the deities of the Hindu pantheon have come to Varanasi to worship Shiva and pray for his help. Brahma built a shrine to Shiva at the Brahmeshwar temple that stands above Dasaswamedha Ghat and Vishnu is said to have prayed to Shiva at the Adi Keshava temple. During the great churning of the ocean, the sagar manthan, when a pot of poison rose to the surface of the water the gods came here to beg Shiva for help. He drank the poison turning his neck blue and thus he is called Neelkantha, the blue necked god. The most important myth about Shiva and Varanasi is that of the jyotirlingam, where Shiva turns himself into a column of light, thus creating the first lingam, which is his symbol. The twelve most sacred shivalingams in the land are called jyotirlingams and three temples in Varanasi claim to have them. According to the jyotirlingam myth, Brahma, Vishnu and Shiva could not agree about who was the supreme deity. They asked the Vedas that are the fount of all wisdom and the Vedas said that Shiva was the greatest of them all. Brahma and Vishnu were naturally unhappy at such a judgement and wanted to test Shiva’s power. Always quick to anger, an enraged Shiva turned himself into a column of glittering light or jyotirlingam. The column pierced the sky, the earth and the netherworld and no one could see where it began or where it ended. Varanasi is the site where the jyotirlingam first appears on earth. Brahma and Vishnu wanted to discover the two ends of this column. So Vishnu turned himself into a boar and began to dig his way into the earth. Brahma turned himself into a swan and flew up into the sky. They both travelled for a thousand years but could not discover the ends of the column of light. When they returned to Varanasi Vishnu admitted that he had failed in his mission and worshipped Shiva as the greatest god. Brahma as the creator was reluctant to admit his defeat. He declared that he had seen the end of the column of light in the sky. Hearing this Shiva finally lost his temper and turned into a raging Bhairava and cut off one of Brahma’s head. Unfortunately this meant that Shiva had beheaded a Brahmin and because of the sin of brahmahatya, the head stuck to his hand. He wandered across the land praying for atonement but it was only when he came back to Varanasi that the skull finally fell off and Shiva was freed of his sin. Kashi Vishwanath (Varanasi, Uttar Pradesh). There are twelve sites where the jyotirlingam appeared on earth and these shivalingams are called swayambhu, or self-created. In Varanasi the shivalingam in the sanctum of the Kashi Vishwanath temple called Vishweshwar is believed to be a jyotirlingam and another lingam within the same temple precinct called Avimukteshwar is also said to be one. Two other temples, the old Omkareshwara temple near Trilochana ghat and the Kedareshwar temple above Kedar ghat also claim to be jyotirlingams and are visited by pilgrims.